Settlers used other methods to irrigate their land besides the historic canals and ditches. 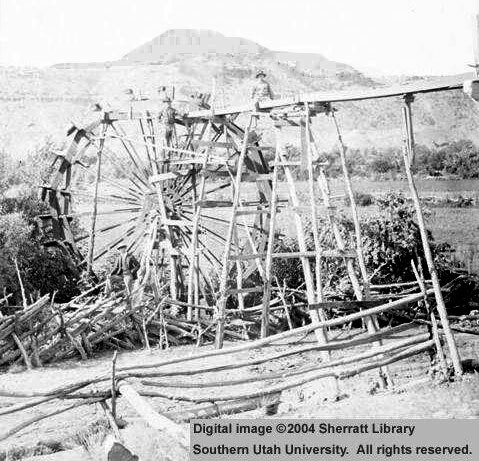 This 1898 photograph shows three men working on a water wheel which raised water from a short feeder canal alongside the Virgin River up to a wooden flume about twenty feet higher than the river which provided water for crops. The Virgin River runs along the northern boundary of Grafton. In May, The Wild Utah Project held a training workshop on the Virgin River at Grafton to assess the health of river in a 200 ft section. Representatives from Zion National Park, Arizona Game and Fish, Arizona Riparian Council, The Utah Nature Conservancy, Arizona Dept of Environmental Quality and others participated in the workshop. The survey looked at: water quality, shape of the floodplain, fish habitat, vegetation, and wildlife habitat. Some results include: no algae growing on river bottom rocks which is a good sign; 50% of banks had overhanging vegetation which are good for fish; soil was undisturbed from vehicles; it had diverse fish habitat with, pools, cobble debris, and runs; all age classes of vegetation were present, seedlings, saplings, and mature. However, much of area included dense non native tamarisk and Russian olive trees which are choking out the native plants. The Grafton Heritage Partnership (Partnership) is interested in managing the floodplain for the benefit of native plant and fish communities. This would include removing the exotic tamarisk and Russian olive trees and restoring the natural cottonwood, willow, and native plant communities. The Grand Canyon Trust holds a conservation easement on the floodplain to protect wildlife habitat. The Partnership will also work with BLM to improve fish and wildlife habitat in this section of river. The tamarisk beetles have arrived in Grafton. All of the tamarisks are brown now and it looks like they are dead from the beetles. In 2006, the City of St. George released beetles along the Virgin River to kill tamarisk. A primary objective of tamarisk biological control is to reduce competition by exotic tamarisk with a variety of native riparian plants, including trees (willows, and cottonwoods), shrubs, and grasses. Unlike expensive chemical and mechanical controls of tamarisk that often must be repeated, the tamarisk beetle does not harm native plants and is self-sustaining in the environment. Recovery of native riparian grasses can be quite rapid under the once closed canopy of repeatedly defoliated tamarisk. However, tamarisk beetle defoliation can reduce nesting habitat for riparian woodland birds until native woodland plants are able to return. Releases of tamarisk beetles are currently on hold until concerns can be resolved regarding safety of tamarisk biological control to nesting habitats of the federally endangered southwestern willow flycatcher. The Partnership hired Arid Land Consultants to apply pioneer plaster to the inside of the kitchen walls of the Russell home. We need to continue to raise funds to plaster the bedrooms. Your support is vital to be able to continue our work on the Russell Home. We noticed on the back wall of the schoolhouse the adobe bricks were sloughing off on top of the rock foundation and needed to be repaired. It appeared as though moisture was wicking up from the rock stem wall.The standard course of action for this kind of damage to an adobe structure is to remove the adobe bricks in the areas of sloughing, putting a vapor barrier on the stone foundation. Arid Land Consultants completed the repairs. Washington County owns the schoolhouse and is a partner in the Grafton project and we split the cost of repairs with them. The Wood Road on BLM land is getting very popular for recreation use and the Partnership is concerned about unmanaged use could negatively impact the road by causing accelerated erosion of the road surface which undercuts the historic dry-laid stone walls that support the structural stability of the road. ThePartnership wrote a letter to BLM for their Trail Management Plan about our concerns that user groups may change the historic alignment by building a new trail, or making shortcuts. We feel it is important to keep the structural and historic integrity of road intact to reflect the effort of the dedicated settlers who built the road. Wood was hauled in wagons down the steep mesa to the south of Grafton from 75 miles away to build the Grafton schoolhouse. Bikers are now jumping off cliffs in sight of the cemetery and scarring the landscape. The Partnership asked BLM to post signs at the top and bottom of the Wood Road to ask bikers to stay on trail. 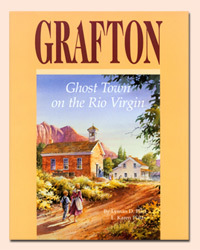 The Grafton Heritage Partnership has Lyman and Karen Platt’s 1998 book, Grafton, Ghost Town on the Rio Virgin, for sale. Excerpt from the book: “Grafton is intriguing to the traveler. Why? Is it the beauty of the area and the thoughts of times past nestled in all these wonders of nature? Is it the peaceful, quiet, breathtakingly beautiful surroundings capable of hosting a bustling community of people that lived so close to each other that community life took on a fellowship of camaraderie,mutual love and support? Is it where survival, as well as success at colonizing that area, meant people had to depend on each other? At times, the traveler may think, Yes, this is the way it ought to be. “If you are interested in buying the book visit our web page at www.graftonheritage.org or write us a letter. The proceeds of the book will go to the Grafton Project. We will also have books available at the Grafton reunion. Descendants of Grafton will hold their annual Grafton Reunion, September 25th, 2010 at the town site from 12-2:00 PM. Everyone is welcome. Bring your lunch, hat and chair and memories to share. We will have a display of historic Grafton pictures in the schoolhouse. The Partnership will have items to sell to raise funds for the Grafton Project such as books, pictures of Grafton and tshirts. There will be a program and if you have any stories you would like to tell about Grafton or a song to sing please call Lou Graff at 702-649-7155 so he can put you on the program. All of our work to preserve Grafton would not be possible without your donations. We look forward to yourcontinued support and generosity in forwarding our collective understanding of this place we know and love- Grafton. Donations are gratefully received and tax deductible. You can donate with a credit card on our secure web page www.graftonheritage.org, Click on support us. There is a donation box at Grafton’s gate. If you have historic photos of Grafton please mail us a copy for our records.